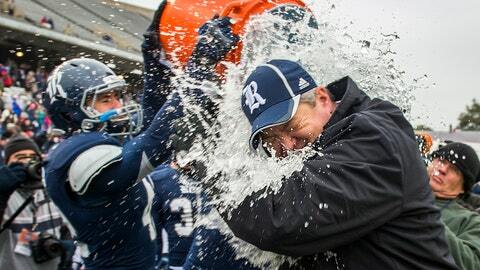 Rice head coach David Bailiff is doused by his players after the Owls defeated Marshall 41-24 in the Conference USA championship NCAA college football game at Rice Stadium, Saturday, Dec. 7, 2013, in Houston. As the players egg on Coach David Bailiff to say yes after the representative gives his â"30-second history" of the game, tension mounts until that final moment and handshake, then, a no-holds-bar celebration takes place. The Owls will play the SEC’s Mississippi State on Dec. 31 in Memphis during the 50th anniversary of the Liberty Bowl. "We know we are in for a tremendous challenge, but that’s what is exciting about the season we have had," Bailiff said of the matchup via the Associated Press. "I know our players are excited to play a team from the SEC and ready to get to work as soon as we can." The New Year’s Eve game will mark the Owls’ first appearance in the Liberty Bowl and their first back-to-back bowl game appearance since 1960 and 1961.